It's not too early to gear up for the holidays, is it? I have done a series of Christmas Card Stamp A Stacks over the years and I will be starting the first class next week. I have three sessions scheduled for this class and I hope you can attend. Session 1 – Monday, Sept 19th @ 9:30 is full but I do have availablity in the remaining two classes. Tuesday, Sept 20th @ 9:30am & Monday, Sept 26th @ 6:30. This is one of the cards we will be doing in class. I was inspired by a card that Mary Fish shared recently. I may have over-ordered a few of the Copper Foil Sheets and so I decided that this card would work well with the Copper Foil. I had a friend just walk into the studio and she oogled over this card. It really is THAT pretty. I'm worried that ya'll will want to do 9 of these cards instead of just 3? 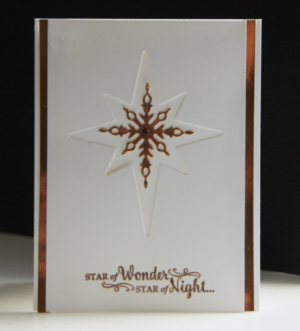 This card was a bit difficult to photograph and you can't see that the small star is inset into the opening. We are using the Copper Embossing Powder to add the sayings. I'm telling you…it's gorgeous!